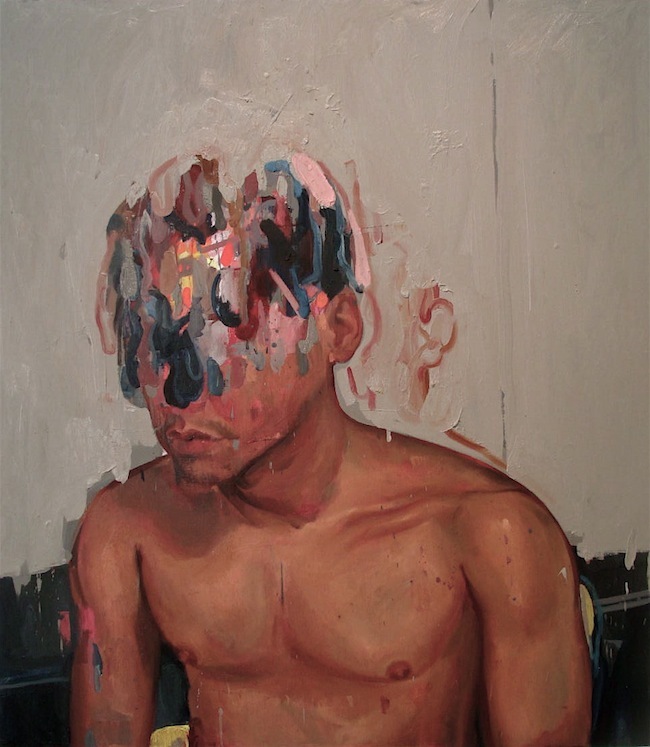 Alejandro Diaz was born in La Piedad, Mexico, and now lives and works in Dallas, Texas. 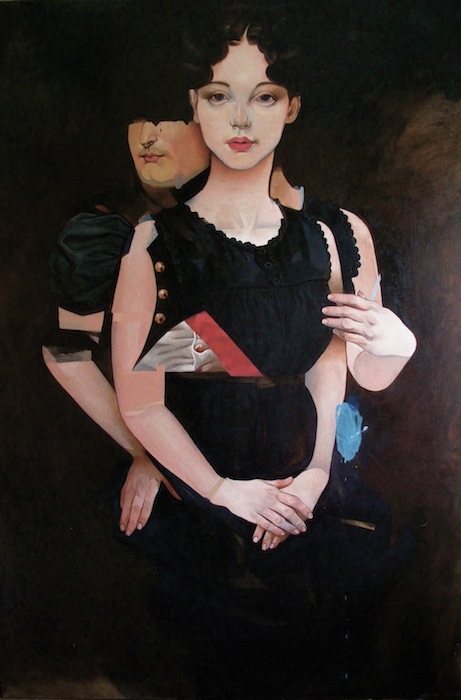 His creative practice evolved from painting simple portraits of family and friends to these more elaborate and layered images, drawing inspiration from sources as diverse as modern pop culture references and old European master painting. Diaz endeavors to tell a story with his paintings, but one that is inconclusive and open to interpretation. ‘A little bit of everything is there, from social justice and politics to the simple appreciation of the color blue or the wit of Porky Pig,’ he says. In 2010 Diaz won the Kobes Art Foundation Award and in 2011 Kirk Hopper Fine Art in Dallas presented his first solo exhibition, Just Between Us. "outsider" affected me very much and deeply moving to me. good work, gifted man. I am not an artist so I won't address, form ,color palette or texture. I do know that this composition elicits a feeling of "Oh yeah, I've felt like that before". Kudos to the artist, because I didn't have to think about it, or analyze it, as soon as I saw it, that thought came to mind. well i dont understand this atr at all, but the colour combination is really awesome!! im a fan of bold darker art...this speaks many tales...grabs me at the core of my soul...truely a masterful expression of the inevitable end to all! visually stunning, reminds me of a couple "trips" I took during my college years. Unique and refreshing, very talented young man! Hope to see more soon. He can express well with his work, especially in "Helena". Good emotions haunting through. Some of the detail in the figures looks too stylized, when perhaps he meant to be more realistic? So many artists have terrific talent but don't take the time to "see" when it comes to rendering. It's not a pre-requisite to create photo like images, but when you've mastered life-drawing, you will know what I'm talking about. But the paintings are still very good..jst would not say mastery work.